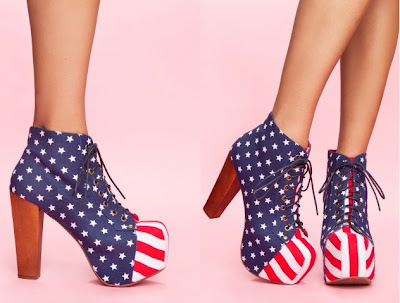 it's safe to say you aren't a fashion blogger unless you own at least 2 pairs of these Jeffery Campbells. I'm not 100% on the Lita boat yet. I'd definitely own a neutral color, the glitter ones, and probably the american flag ones. so..what's your take on this trend? Love it or hate it? I want to hear! so on the fence after we talked about them. but man, those american flag ones! i will end up getting them... but i saw a girl fall in them yesterday, did NOT look fun. any clue if those were still at kop? sold out online. if I ever see you in those american flag ones, I will vomit. on them.